From its very beginning, DJing has ranked among the most progressive types of music production. 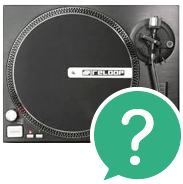 It's no surprise then that DJ equipment continues its dynamic development, with original analogue technology (turntables + mixing console) gradually being replaced by more modern digital equipment. The cutting edge of this technology today is all-in-one DJ controllers, i.e. complete DJ systems. All DJ controllers are based on digital technology, which makes work with music tracks far simpler than earlier analogue technology. And yet, not all DJ controllers are all-in-one DJ controllers (complete DJ systems). All-in-one DJ controllers are only DJ controllers that integrate the functions of turntables and mixing consoles in a single platform. All-in-one DJ controllers are a good choice for experienced DJs who want to take full advantage of digital technology to process audio tracks. These DJ controllers are also ideal for complete beginners, as digital technology is easier for them to work with than older DJ technology. If you would like to consult with an expert, don't hesitate to contact us. We will be happy to help you determine which complete DJ system is best for you. You can call us at 020 8089 1481 (Mon-Fri, 9 a.m. - 5 p.m.) or send us your questions by email to . Complete DJ systems are usually divided into three sections, with two serving to control music tracks and one for the mixing console. The majority of DJ controllers can work with two to four music channels and are typically equipped with their own sound card. Hardware control of complete DJ controllers is most often handled with pads, knobs, JOG wheels and other similar equipment. The ergonomics of many devices is derived from classic analogue DJ technology (involving 2 rotating disks simulating turntables), though some DJ controllers are equipped with more original control. Remember, the quality of control elements is essential for DJs, especially with respect to the precision and sensitivity of control. Software is incredibly important in DJ systems. Good software allows you to connect the DJ controller easily to a notebook or tablet. It also enables you to easily mix music and intuitively shape audio tracks. The most popular DJ software is Serato DJ, Traktor, DJAY and VirtualDJ. The majority of these devices include a license for at least the basic version of some of these programs. 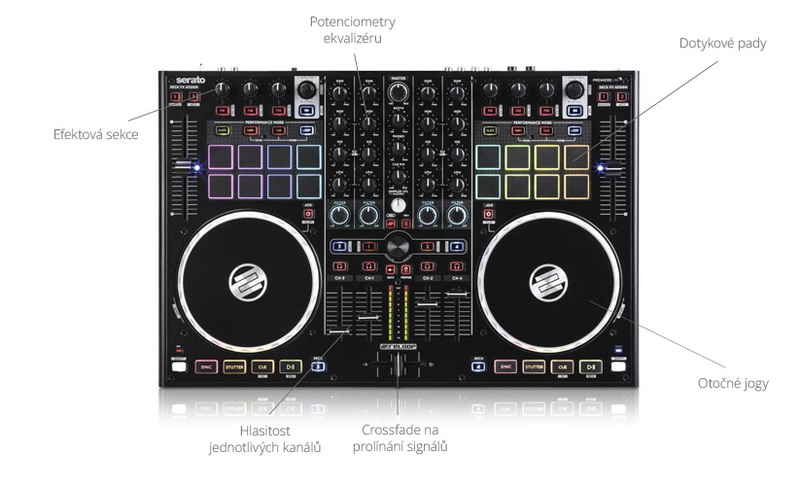 All all-in-one DJ controllers are designed for simple and problem-free connection to a computer or tablet (iPad) - so-called plug and play. The standard connection to a PC is through the USB port. 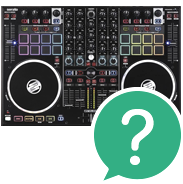 Some all-in-one DJ controllers work without a computer, though with the majority of controllers a computer (tablet) connection is necessary. Although the vast majority of complete DJ systems are compatible with all of the major operating systems, it's best to check compatibility with your computer (iPad) in the product's technical documentation. It's also a good idea to check the number of inputs and outputs on the DJ controller.